Are You the Next Online Superhero? Already have an account? Wouldn't it be fantastic if you could create more with your content? If you could get more out of your content marketing to beat your competitors? Manage your website and blog with the least of effort. Get in touch with your followers and discuss what’s on your mind using Social Media. Inspire and activate people. Whether you already feel like an online superhero or whether you’re keen on becoming one — Neosense will give you everything you need to expand your online power. With Neosense you can centralize your data and content so that managing websites, blogs and social media becomes easy and fun. Let Neosense manage your online marketing and you will expand your business worldwide. Websites and blogs built with Neosense are compatible with all common Internet browsers like Microsoft Internet Explorer, Mozilla FireFox, Google Chrome and Opera. Neosense embraces the power of your PC. Using desktop software instead of browser-based software will provide you with far greater flexibility and more opportunities to manage your content. 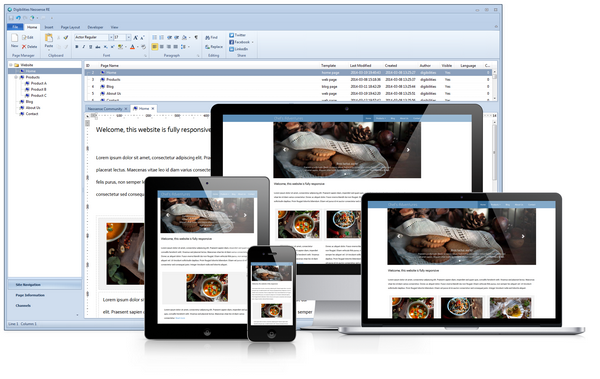 Neosense generates user-friendly content and search engine-friendly source codes. Neosense is W3C compatible. Do you love Microsoft Office too? Neosense offers an intuitive working environment based on the MS Office look and feel. Neosense even supports the copying and pasting of content from and to Office products without losing images, tables and formats. We listen to our community and act on what its members tell us. We are constantly creating unique stuff. We are constantly improving our services. We love what we do and love sharing this with you. We are so glad to meet you. We offer plenty of knowledge for free. Get your free Neosense 14 day trial now! © 2001 - 2019 DIGIBILITIES ~ Our heartfelt thanks go out to our loved ones..!